The public is divided in overall views of gun policy in the United States. Yet large majorities of Americans continue to support a number of specific gun policy proposals, including restrictions on gun sales to the mentally ill and expanded gun background checks. Attitudes about guns and gun policies divide gun owners and non-owners, Republicans and Democrats, and urban, suburban and rural residents. Overall, 52% of Americans say gun laws should be stricter than they are today, while nearly as many say they are about right (30%) or should be less strict than they are today (18%). Americans also differ about who should be able to own guns, where guns should be legally permitted and what types of guns should be legally available. A majority of Americans (64%) say most people should be able to legally own guns, but some people should not. There is less agreement on the places that guns should be legally permitted and the types of guns that should be legally available. Most people take a middle-ground approach on both questions: 35% say guns should be permitted in most places, while some places should be off-limits; another 28% say guns should be allowed in some places but not most places. Similarly, a majority (70%) says that most or some types of guns should be legally available for sale in the U.S.; just 20% say almost all types of guns should be legally available, while only 10% say almost no types should be available. As in the past, a number of specific gun policy proposals draw extensive public support. About nine-in-ten Americans (89%) favor preventing people with mental illnesses from purchasing guns. Nearly as many favor requiring background checks for private gun sales and at gun shows (84%) and barring gun purchases by people on no-fly or watch lists (83%). Roughly two-thirds or more strongly favor all of these proposals. Proposals for easing gun laws draw much less support. About half say they favor allowing people to carry concealed guns in more places (46%) and allowing teachers and school officials to carry guns in K-12 schools (45%). Even fewer Americans support shortening waiting periods for buying guns legally (36%). The public is broadly opposed to allowing people to carry concealed guns without a permit: 81% oppose this proposal, with two-thirds strongly opposed. Just 19% favor allowing people to carry concealed guns without a permit. 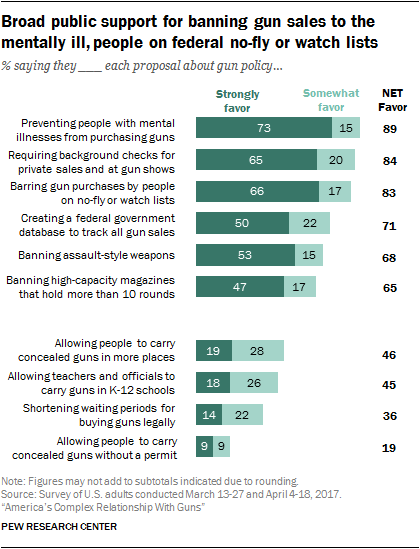 Large majorities of gun owners and non-gun owners favor banning gun sales to the mentally ill, expanded background checks on gun sales and barring gun purchases by people on federal no-fly or watch lists. But there is less agreement on other policy proposals, including those that would make it easier to purchase and carry a gun. 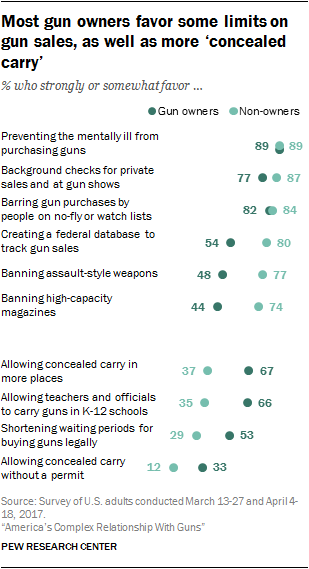 Among those who don’t own guns, 80% favor creation of a federal database to track gun sales, 77% back an assault-weapons ban and 74% support a ban on high-capacity ammunition magazines. No more than about half of gun owners support any of these policies. The differences are just as stark regarding proposals for easing gun restrictions. Two-thirds of gun owners favor allowing people to carry concealed guns in more places (67%) and allowing teachers and school officials to carry guns in elementary and secondary schools (66%). These proposals draw support from less than 40% of people who do not own guns. Other proposals draw less support from both groups, though about half of gun owners (53%) favor shorter waiting periods on gun sales, compared with 29% of non-gun owners. Just a third of gun owners and only 12% of non-gun owners support allowing people to carry guns without a permit. Partisan views on gun policy proposals fall along similar lines as the opinions of gun owners and non-gun owners. Large majorities in both parties favor preventing the mentally ill from buying guns (89% each), background checks for private gun sales and gun shows (90% of Democrats, 77% of Republicans), and barring people on federal watch lists from buying guns (85% of Democrats, 82% of Republicans). Other proposals are much more divisive. For instance, only about a quarter of Democrats and Democratic-leaning independents (26%) support allowing people to carry concealed guns in more places, compared with 72% of Republicans and Republican leaners. The gap is nearly as wide in support for allowing teachers and school officials to carry guns in schools (26% of Democrats, 69% of Republicans). Both partisanship and gun ownership are key factors in attitudes about gun policies. On several issues, there are wide differences between Republican and Democratic gun owners – and even larger differences between members of both parties who do not own guns. There is broad support among gun owners and non-gun owners in both parties for the bans on gun sales to the mentally ill and people on no-fly or watch lists, as well as for background checks on private gun sales. But Republican gun owners stand out for their low levels of support for a federal gun database and bans on assault-style weapons and high-capacity ammunition magazines. Just 43% of Republican gun owners back a federal gun database, 38% favor a ban on assault-style weapons and 32% support banning sales of high-capacity ammunition magazines. Among Republicans who do not own guns – and Democratic gun owners and non-gun owners – each of these proposals draws majority support. Overall, more Republicans than Democrats favor proposals to loosen gun control laws; however, this support is significantly stronger among Republican gun owners than among non-owners. 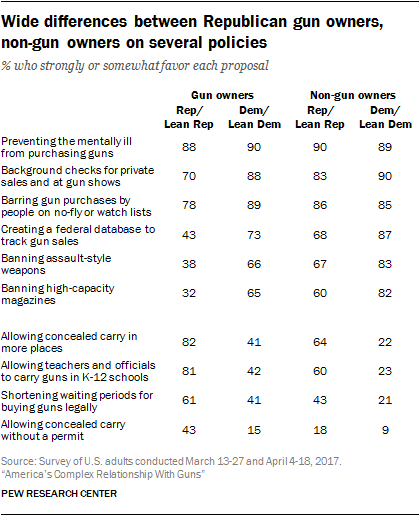 Similarly, Democrats are less supportive overall, but Democratic gun owners give these proposals somewhat more support than Democrats who don’t own guns. A larger share of Republican gun owners support each of the proposals to loosen gun laws than any other group. About eight-in-ten favor allowing concealed carry in more places (82%) and allowing teachers to carry in schools (81%). A smaller majority backs shortening waiting periods to buy guns (61%), and about two-in-five favor concealed carry without a permit (43%). Majorities of both Democratic gun owners and Republican non-owners have similar attitudes about shortening waiting periods and allowing concealed carry without a permit. These groups are divided on expanding concealed carry to more places and allowing teachers to carry guns in schools: about three-in-five Republicans non-owners favor them, compared with two-in-five Democratic owners – a gap of about 20 percentage points on each. Democrats who do not own guns are strongly opposed to all of these proposals that would make gun laws less strict: Only about one-in-five support expanding conceal carry, carrying by teachers and shortening waiting periods, and just 9% support concealed carry without a permit. Views on gun policies also vary widely by the types of communities in which people live. Rural residents are generally more skeptical of proposals to toughen gun laws than are people who live in suburban and urban areas. 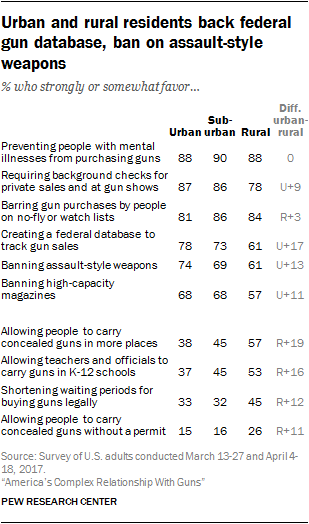 Rural residents also tend to be more supportive of proposals to loosen gun restrictions. In part, these gaps reflect differences in partisanship and gun ownership in these communities. Rural residents are more likely than urban and suburban residents to identify as Republicans or lean Republican; people who live in rural areas also are more likely to own guns than those in other communities. Still, majorities of rural, suburban and urban residents favor a federal gun database, expanded background checks and some restrictions on gun sales. However, 57% of rural residents support allowing people to carry concealed guns in more places. Less than half of those in suburbs (45%) and urban areas (38%) support increased concealed carry. There are similar differences among people in different types of communities in views of allowing teachers and school officials to carry guns in K-12 schools. As with views of specific gun policy proposals, opinions about whether gun laws in the U.S. generally should be stricter or less strict are divided by partisanship, gun ownership and community type. Democrats broadly favor making gun laws stricter than they are today. Three-quarters of Democrats and Democratic leaners – including 78% of non-gun owners and 62% of gun owners – say gun laws in this country should be stricter than they are today. 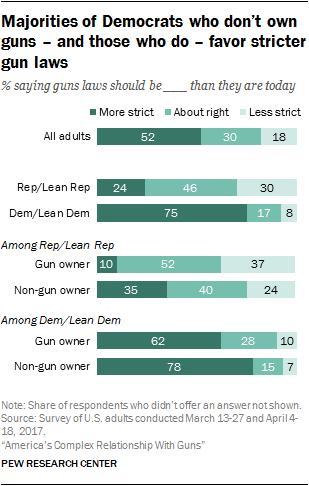 Republicans and Republican leaners are divided: 46% say current gun laws are “about right,” while 30% say they should be less strict and 24% say they should be stricter. About half of Republican gun owners (52%) and 40% of Republican non-gun owners say gun laws are about right. More than a third of Republicans who do not own guns (35%) support stricter gun laws in the U.S., compared with just 10% of Republican gun owners. And while 37% of Republican gun owners say gun laws should be less strict, only 24% of Republican non-gun owners say the same. Another factor in attitudes about the nation’s gun laws is how gun owners and people who do not own guns feel about the prospect of their own future gun ownership. 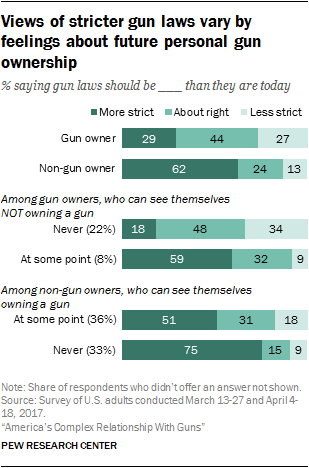 Most people who own guns say they can never see themselves not owning a gun: Among this group, just 18% say gun laws should be stricter. Among the smaller share of gun owners who say at some point they could see themselves not owning a gun, 59% favor stricter gun laws. Among those who do not currently own guns, about as many say they could see themselves owning a gun at some point as say they could never see themselves owning a gun. Among non-gun owners who are open to the possibility of owning a gun in the future, 51% favor stricter gun laws. By contrast, 75% of non-gun owners who say they can never see themselves owning a gun back stricter gun laws. Gun owners and non-gun owners hold different views about who should be able to legally own guns, where guns should legally be permitted, and what types of guns should be legally available. A majority of the public (64%) says that most people, but not all, should be able to legally own guns; however, there is a 24-percentage-point gap between owners and non-owners on this question. Fully 80% of gun owners say most people should be able to own guns, plus another 9% who say almost everyone should be able to. A majority of non-owners say most people should be able to own guns (56%), but about one-third either say that some, but not most, people should be able to own guns (24%) or say that almost no one should be able to own guns (12%). Some respondents who said most, but not all, people should be able to own guns legally were asked to describe in their own words “what should disqualify someone from being able to legally own guns.” Many gun owners and non-owners said people with mental health issues should be disqualified, as well as those who have felony convictions or histories of violent behavior. Greater differences emerge between owners and non-owners on the places guns should be allowed and what types of guns should be available. A majority of gun owners say people should be able to carry guns at least most places, while non-owners are more divided on the issue. About twice as many gun owners (34%) than non-owners (15%) say people should be able to carry guns almost everywhere. 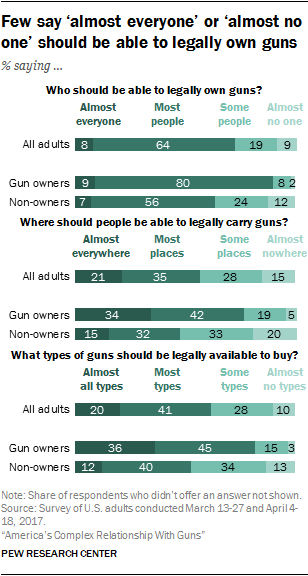 Conversely, four times more non-owners (20%) than gun owners (5%) say people should be able to carry almost nowhere. Some who said people should be able to carry guns most, but not all, places were asked “what are some of the places … people should not be able to legally carry guns?” Many mentioned crowded public places, schools, movie theaters and places that serve alcohol. The share saying almost all types of guns should be legally available (36%) is higher among gun owners as well. Far fewer non-owners say this (12%). About twice as many non-gun owners (34%) as gun owners (15%) say some, but not most, types of guns should be available. Those who said most, but not all, types of guns should be legally available were asked to share, in their own words, “What are some of the types of guns you think should not be legally available to buy?” These respondents frequently mentioned military-style weapons – though definitions of what constitutes “military style” differed considerably. Some people mentioned semiautomatic or automatic rifles, such as AK-47s, while others mentioned more powerful military equipment such as missiles, explosives, tanks and fighter aircraft. While relatively few people have ever contacted public officials about guns (15%) or given money to organizations taking positions on the issue (16%), gun owners are more politically engaged on gun issues than other Americans. Gun owners are more likely than non-gun owners to say they have ever contacted public officials to express their opinion on gun policy: 21% of owners say they have done this, including 9% who say they did so in the past 12 months, while only 12% of non-owners say they have ever done this. Furthermore, those who think gun laws should be less strict are more likely to contact public officials on the issue (22% have ever done so), compared with those who think gun laws should be stricter (15%) or are about right (10%). This gap increases further among gun owners: About as many gun owners who want less strict laws (19%) have contacted officials in the last year as owners who want stricter laws have ever contacted officials (20%). A larger share of gun owners contribute money to organizations that take positions on gun policy (28% have ever done so and 12% have in the last year) than non-owners (10% ever and 6% in the last year). 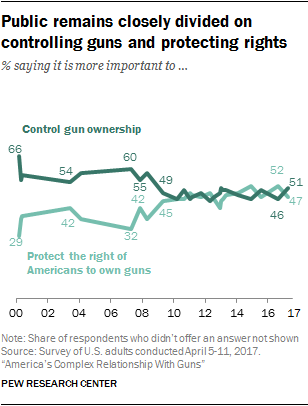 The public is closely divided over whether it is more important to protect the right of Americans to own guns or to control gun ownership. In a nationally representative Pew Research Center survey conducted April 5 to 11, 2017, among 1,501 adults over 18, 51% said it was more important to control gun ownership and 47% said protecting the right to own guns is more important (see long term trends on the public’s views about guns). These attitudes have been mostly stable over the past eight years – with the public about evenly divided between protecting gun rights and controlling ownership. Attitudes on which is more important have shifted about 5 points since last August, however. Then, 52% said it was more important to protect gun rights, compared with 46% who said it was more important to control gun ownership. 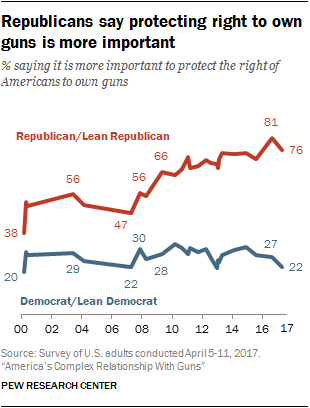 Republicans and Democrats remain widely divided over the importance of protecting the right of Americans to own guns. About three-quarters of Republicans and Republican leaners (76%) say protecting gun rights is more important, compared with about a quarter of Democrats and Democratic leaners (22%). The gap between the two parties has increased significantly since 2000, when there was an 18-percentage-point gap between Republicans and Democrats. Today there is a 54-point gap. The public is divided over whether the National Rifle Association (NRA) has too much influence or the right amount when it comes to gun laws in this country: 44% say it has too much and 40% say the right amount. Another 15% say it has too little influence. Compared with gun owners, adults who do not own guns are more likely to say the NRA has too much influence. Half of non-owners say the NRA has too much influence and just 34% say the right amount. About half of gun owners (53%) say the NRA has the right amount of influence and 29% say it has too much. Few in either group say it has too little (17% among gun owners and 14% among non-owners). There are bigger differences in the way the NRA is viewed among Republicans and Democrats. 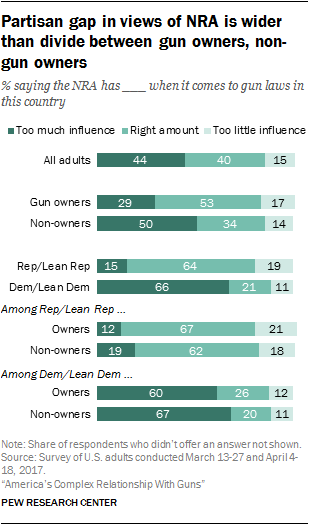 Two-thirds of Democrats and Democratic leaners say the NRA has too much influence; only 15% of Republicans and Republican leaners say the same. About two-thirds of Republicans say it has the right amount of influence, compared with 21% of Democrats. A similar share of Republican gun owners and non-owners say the NRA has the right amount of influence (67% of owners and 62% of non-owners). Democrats tend to see the NRA similarly, regardless of whether they personally own a gun: 60% of Democratic gun owners say the NRA has too much influence; 67% of Democrats without a gun say the same.